Researchers have created a process that can cool molecules to near absolute zero temperatures through evaporative cooling. Previous processes were then limited to ultra-cooling atoms. Ultra cold atom physics deals with atoms that are at a temperature close to absolute 0 or 0 K (kelvins). In this field of science, temperature is measured at the nanoscale or at nano-kelvins (nK). JILA researchers developed a new magnetic trap and a new technique to achieve "evaporative cooling" of hydroxyl molecules (one hydrogen atom bonded to one oxygen atom). A microwave pulse at a specific frequency converts hot molecules inside the trap to a slightly different energy state. A small electric field is pulsed on briefly to destabilize and eject these converted molecules from the trap. As the microwave frequency is slowly altered, molecules distributed inside the trap (which has a varied magnetic field strength) are progressively converted and removed from the top of the trap, where molecules are hotter, to the bottom, where molecules are cooler. Since it is impossible to bring an object to absolute zero (as stated in the Third Law of Thermodynamics), ultracold atom physics study objects that are close to absolute zero. The coldest an atom has been brought down to is 0.45 nK (nano kelvin) or 4.5 x 10-10 K or 0.00000000045 K.
At these levels, atoms start to behave differently and their properties start to move from classical physics to quantum mechanics. A property that scientists are interested in is the transformation of atoms into a new form of matter called the Bose-Einstein Condensate (BEC). The Bose-Einstein condensate happens when atoms that are brought down to near absolute zero start to behave like waves rather than particles. As the temperature goes down, these atoms start to vibrate in the same wavelength. Because of this, they start to behave like a single mass object, the Bose-Einstein condensate. With evaporative cooling, atoms with higher energy levels (temperature) are ejected out of an optical or magnetic trap until only atoms with the lowest energy levels are left. BECs and ultracold atoms are at very low temperatures are highly sensitive to heat (2nd Law of Thermodynamics). Practical applications of ultracold atom physics range from super sensitive sensors to atom chips used in diodes and semiconductors. Current technologies used by magnetic levitation (mag-lev) trains, quantum computers and MRI devices utilize principles behind ultracold atom physics. 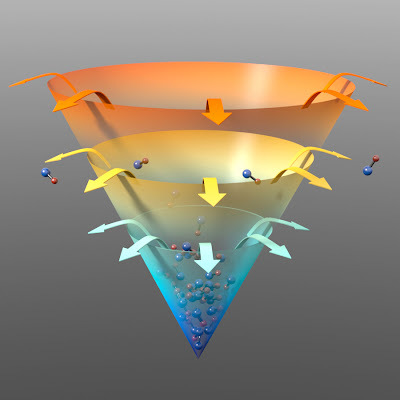 Achieving a goal considered nearly impossible, JILA physicists have chilled a gas of molecules to very low temperatures by adapting the familiar process by which a hot cup of coffee cools. Evaporative cooling has long been used to cool atoms, at JILA and elsewhere, to extraordinarily low temperatures. The process was used at JILA in 1995 to create a then-new state of matter, the Bose-Einstein condensate (BEC) of rubidium atoms. The latest demonstration, reported in the Dec. 20, 2012, issue of Nature,* marks the first time evaporative cooling has been achieved with molecules—two different atoms bonded together. JILA researchers cooled about 1 million hydroxyl radicals, each composed of one oxygen atom and one hydrogen atom (OH), from about 50 milliKelvin (mK) to 5 mK, five-thousandths of a degree above absolute zero. The 70-millisecond process also made the cloud 1,000 times denser and cooler. With just a tad more cooling to below 1 mK, the new method may enable advances in ultracold chemistry, quantum simulators to mimic poorly understood physical systems, and perhaps even a BEC made of highly reactive molecules. The same JILA group previously used magnetic fields and lasers to chill molecules made of potassium and rubidium atoms to temperatures below 1 microKelvin. ** But the new work demonstrates a more widely usable method for cooling molecules that is potentially applicable to a wide range of chemically interesting species. "OH is a hugely important species for atmospheric and combustion dynamics," says JILA/NIST Fellow Jun Ye, the group leader. "It is one of the most prominently studied molecules in physical chemistry. Now with OH molecules entering the ultracold regime, in addition to potassium-rubidium molecules, a new era in physical chemistry will be upon us in the near future." JILA is a joint institute of the National Institute of Standards and Technology (NIST) and the University of Colorado (CU) Boulder. The results are the first to be published from the first experiments conducted in JILA's new X-Wing, which opened earlier this year. JILA theorist John Bohn collaborated with Ye's group. In evaporative cooling, particles with greater-than-average energy depart, leaving a cooler and denser system behind. Unlike coffee, however, the trapped hydroxyl molecules have to be tightly controlled and manipulated for the process to work. If too many particles react rather than just bounce off each other, they overheat the system. Until now, this was widely seen as a barrier to evaporative cooling of molecules. Molecules are more complicated than atoms in their energy structures and physical motions, making them far more difficult to control. To achieve their landmark result, Ye's group developed a new type of trap that uses structured magnetic fields to contain the hydroxyl molecules, coupled with finely tuned electromagnetic pulses that tweak the molecules' energy states to make them either more or less susceptible to the trap. The system allows scientists not only to control the release of the hotter, more energetic molecules from the collection, but also to choose which locations within the trap are affected, and which molecular energies to cull. The result is an extremely fine level of control over the cooling system, gradually ejecting molecules that are physically deeper and relatively cooler than before. JILA scientists say it appears feasible to cool OH molecules to even colder temperatures, perhaps to a point where all the molecules behave alike, forming the equivalent of a giant "super molecule." This would enable scientists to finally learn some of the elusive basics of how molecules interact and develop novel ways to control chemical reactions, potentially benefitting atmospheric and combustion science, among other fields.